The Regional Transportation Authority (RTA) manages the 3 public transit operations in northeastern Illinois: The Chicago Transit (CTA), Metra commuter rail and Pace suburban bus. For information on routes and schedules, contact the RTA via their website at www.rtachicago.org or call their Transit Information Hotline at 312-836-7000. Getting to McCormick Place is possible by using the city transit system. The Chicago Transit Authority provides the following bus service and runs approximately every 15 minutes. Note: The McCormick Place stop is at the South Building located Martin Luther King Drive and 23rd Street. Upon entering the Building, proceed through the Concourse, up to Level 3 and continue through the covered sky bridge that crosses Lake Shore Drive. At that point, you have entered Lakeside Center. The Arie Crown Theater is located on Level 2. 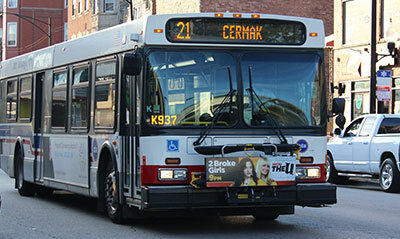 The #3 King Drive bus and the #21 Cermak bus make stops at McCormick Place. #3 King Drive Route Map with Hotels | Metra/CTA Bus Map It’s easy to pay your fare. On buses, you pay as you enter the bus using a Ventra Card. Please visit the Chicago Transit Authority “CTA Fares & Tickets” page for a complete listing of payment card options and fares available to you: www.transitchicago.com/fares/. The nearest CTA rail station is located at the intersection of Cermak Road and State Street, 2 blocks (0.15 mile) from the northwest corner of the McCormick Place West Building – Gate 41- located at Cermak Road and Indiana Ave. Located on Level 2.5 of the Grand Concourse in the South Building, the METRA commuter railroad provides direct service within seven minutes to and from downtown Chicago. Service from the Randolph Station (nearby the Fairmont Hotel) to McCormick Place begins early morning, with more frequent pick-ups during rush hours. Shuttle connections can be made to the METRA system. METRA services the Midwest as far north as Kenosha, Wisconsin; northwest to Fox Lake and Harvard; west to Elgin, Geneva and Aurora; southwest to Joliet and Orland Park; south to University Park; and east to South Bend, Indiana. More than 5,800 city taxis are at your service in Chicago. Facility direction signs and personnel at the Concierge Desk will direct attendees to gates that are designated for your event. There is a Shared Ride Program available for those flying into O’Hare and Midway and taking a cab from one of these airports to either McCormick Place or downtown.